HD DVD players are outselling their Blu-ray rivals by a margin of 20 per cent in theUS. That's according to figures released by the HD DVD Promotional Group this morning. The figures do not take into account sales of the Blu-ray equipped PlayStation 3 console; only dedicated set-top players were included in the calculations. This means that while PlayStation 3 sales will put Blu-ray slightly in the lead overall, more people are buying standard HD DVD players than Blu-ray ones. The HD DVD group also said that HD DVD movie sales exceeded 75,000 in the last week of May, marking a significant improvement. Overall high definition sales in the US hit a record last week as well, hitting $5.2m (£2.64m) in actual consumer spending, which was 31 per cent higher than the previous record for the two formats. This highlights the growing consumer appetite for HD content across the board. The HD DVD promotional group has been pushing its products fairly hard over the last three weeks, in an aggressive spring marketing campaign. With successive price drops by Toshiba, weekly player sales doubled in April when the price dropped from $499 to $399 (£200), doubled again during the first week of the latest promotion in late May, and increased again last week. "Toshiba's latest promotional efforts are clearly resonating with consumers and showing that price is king when it comes to hardware," said Craig Kornblau, chairman of the North American HD DVD Promotional Group. "Behind the increase in sales for hardware and movies, you're seeing fundamentally lower manufacturing costs and ease of authoring for HD DVD. That's the type of model that can scale." By this coming weekend, North American consumers will have purchased 150,000 dedicated HD DVD players, which are holding a 4-to-1 movie attach rate over competing formats. However even this figure isn't really cause for celebration: 150,000 represents one HD DVD player for every 500 US households. 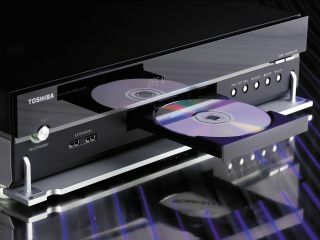 The Toshiba HD-A2 model has also reached the top-seller mark among all DVD players on Amazon.com, and is officially the best-selling next-gen DVD player model to date.